Recently, my husband ran out of deodorant. We’ve tried lots of different natural ones and he hasn’t really loved any of the ones we’ve chosen. They have all worked, but for various reasons they weren’t his favorite. Plus, if you’re buying a mainstream “natural” brand, chances are it still contains aluminum — which is not something you want to be rubbing on your skin, especially near your lymph nodes (your body detoxes itself by sweating; aluminum stops it and gets absorbed, which some think contributes to breast cancer). Since I’ve been bitten by the DIY bug lately, I decided to make him a totally natural alternative. I did not want to use baking soda, because it has such a high pH that many people find it hard on their armpits — they experience peeling or soreness. It makes sense that we don’t really want a high pH item there, because we need to sweat out the junk. Deodorant‘s goal is to help you not smell, and to aid the detox — not stop the sweat. Instead of baking soda, or even arrowroot (another common ingredient), I went with French green clay. I’ve been using it lately in this mask, and it has been working so well to clear up my acne that I thought it would go great in deodorant too! I love the idea of a natural clay deodorant — it detoxes you, naturally! I also chose coconut oil for its antibacterial properties, shea butter for its nourishing properties, and apricot oil for its sensitive skin and healing properties. For essential oils, I mixed tea tree and eucalyptus. I wish I’d had pine or something more masculine since this was for my husband. For myself, I like to blend orange, lavender, and neroli. You can choose whatever oils you prefer, though! Or you can leave them out entirely for an unscented deodorant. Totally up to you. This comes together really fast. It is easy to make. And it will stay solid at room temperature because of the shea butter and beeswax. It will become somewhat soft in the summer, though, if it gets really warm. It’s pretty awesome for a fully natural clay deodorant. I chose to put mine in these empty deodorant containers I bought on Amazon. You could also pour this into a 4-oz. jar, if you prefer. I think it will be easier to use in the containers, but they are plastic. Up to you. Step 1: In a small saucepan over low heat, combine coconut oil, shea butter, apricot oil, and beeswax. Step 2: When the oils are completely melted, add the clay, 1 tbsp. at a time, stirring after each addition. Step 3: Add the essential oils, if you are using them. This is pretty mildly scented; you can use more if you prefer. Step 4: Pour into your jar or container and let it cool and harden completely. If you want it to go faster, let it sit on the counter for 10 minutes to cool and harden slightly (so it won’t spill so easily) then transfer to the freezer for another 10 minutes. Do you use homemade natural deodorants? 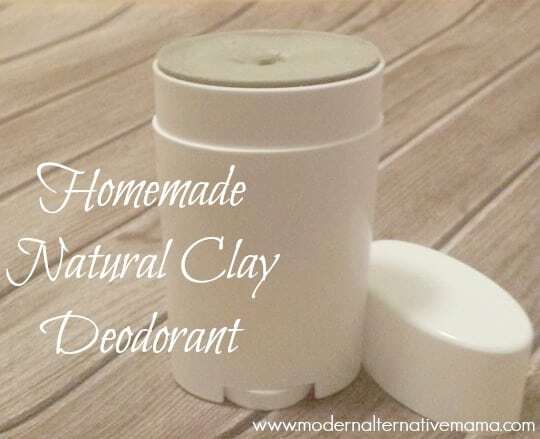 Have you ever tried a natural clay deodorant? This sounds wonderful, but I have a slight apricot allergy. Nothing serious, but I just know that this recipe would cause a rash as is. Any suggested alternative to the apricot oil? Katie, You can use almond oil, sesame oil or grapeseed oil, you just want something that will absorb into the skin easily. I myself do not like apricot oil, I find it very drying. My favorite is the almond oil. Hi, which sort of Shea butter did you use? I have only the unrefined one (non deodorized) and I wonder if the nutty scent will negatively affect the final results, since it’s quite overpowering. Do you think that refined cacao butter might be a better option? I’ve tried baking soda deodorant, works great for smell…hurts my pitts too much like you said. I’ve substituted with arrowroot..that didn’t work at all for me. The last month I’ve gone deo free which isn’t working so nicely in the heat; granted I need to work on my diet…that may help some on the smell…I don’t own any green clay..I do have bentonite clay…do you think this would work? Hey there, great recipe by the looks of it. Just wondering how you would apply a deodorant in this form if you use a jar? Would you have to spoon it out onto your skin, rub your fingers on the deodorant till it melts then apply to skin or something else? Thanks :)! Could the green clay be substituted with bentonite clay?